The software is specifically focused on the rapid creation and modification of 3D sheet metal parts and assemblies. The system understands the attributes of sheet metal and utilizes user-definable parameters for precise automatic unfolding. The RADAN 3D model can be updated with manufacturing information such as expected radius and setback values, from Radbend, RADAN’s offline bending programming solution. RADAN 3D can be used in the Bottom Up approach. This means the user can design each part in isolation and they bring them all together to form large assemblies. 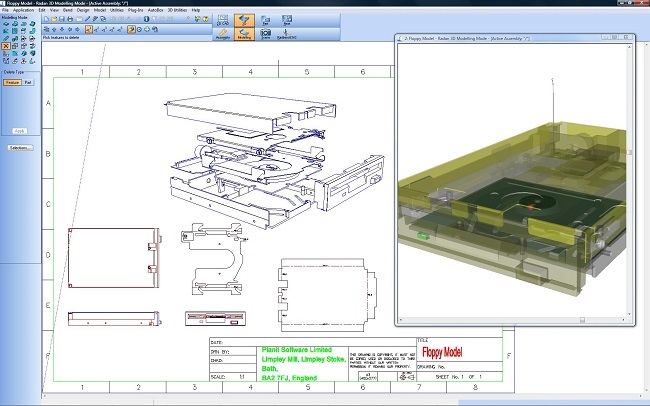 The unique multi view feature in RADAN 3D offers the user the ability to turn 2D orthographic views into a 3D model. Simply extract profiles from an existing 2D drawing or draw 2 or more 2D views of an object, press the button and RADAN 3D will convert these views into a 3D model. It really is the quickest and simplest way to go from 2D to 3D. RADAN 3D is a simple to use 3D design tool. It is ideal for the design of sheet metal parts and assemblies. However it doesn’t have to stop there, RADAN 3D is an all-round 3D modelling tool that can handle all of your 3D design and modelling requirements.